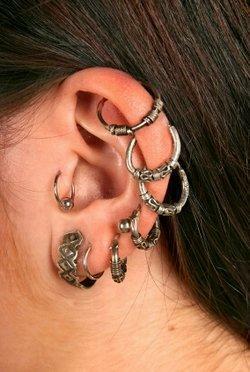 Exotic ear piercings are fascinating alternatives to traditional lobe piercings. Learn more about them right here. Lobe piercings can look chic, but they really are tame when compared to a number of more exotic ear piercings body modification lovers can choose. The quest for unique piercings has led more adventurous souls to explore the rest of the ear. Most of these piercings involve areas of cartilage that many people would never consider piercing. This may be due a fear of possible pain, or a simple lack of knowledge about which types of jewelry best suit these locations. However, for people who overcome these obstacles and give one or more of these unusual piercings a try, ear piercing can become a bit of an addiction. They love their alternative piercings so much that they begin piercing each possible portion of the ear the way other people collect stamps. The results can be quite stunning, and in any case they're sure to draw a lot of attention. These piercings are performed at various points around the ear's edges. Lobe tunnels: This piercing begins much like any other lobe piercing. However, the hole is gradually widened by periodically inserting thicker gage jewelry to gently stretch the opening. This can be limited to a simple tunnel ring of four to five millimeters width, or the opening can be stretched large enough to accommodate the diameter of a broom handle or more. It all depends on the look you want. You can fill the holes with open tunnel rings and solid plugs or, once stretched, leave them open and hang hoops from them. Transverse: Instead of piercing straight through the face of the ear lobe, a transverse piercing passes sideways through it from west to east. A barbell is a good choice for this piercing. Helix: This term is used to describe piercings performed in the outer rim of cartilage that begins just beyond the back of the ear lobe. Forward helix:Similar to the helix, this piercing is placed in the section of rim that faces the eyes. Industrials: Also done in the rims, this term refers to two or more basic helixes that are connected with a barbell. Orbits: Similar to the industrial, this piercing involves two helixes connected by a hoop or captive bead ring. Anti-tragus: This section of cartilage is the rise just above the lobe. It's a good location for a small hoop or barbell. Anti-helix: This piercing is located just behind the anti-tragus in that first fold of harder cartilage. Small straight or curved barbells are most suitable here. Rook: This piercing goes in the thick fold of cartilage just below where a forward helix would be placed. Curved barbells work best in this location. Daith or Wisdom: A daith goes in the front ridge of cartilage that leads to the ear canal. It is just above the tragus and can be fitted with a hoop or curved barbell. Tragus: The tragus is that small protrusion of cartilage just in front of and slightly over the ear canal. It's an interesting location for a stud or captive bead ring. Conch: The conch is that flat area of cartilage that forms the inner base of ear. Piercing this location is difficult and should be left to a very experienced professional. The location is most suitable for a stud. It's a fact that some people are more sensitive to pain than others, but the pain common to most ear piercings does seem to fit a few generalities. Lobe piercings are relatively painless. There's a momentary sting when the piercing gun pierces the flesh, but it's over almost as quickly. Piercings performed in areas with a little more cartilage generally cause a bit more pain. Piercings placed where there is thick ear cartilage are typically the most painful ear piercings of all. Since cartilage doesn't have as much blood flow as fleshier parts of the ear, it can take a bit longer to heal. The average lobe piercing takes approximately six weeks to heal. In comparison, a cartilage piercing averages ten to twelve weeks for complete healing barring any infections. In some cases, healing may take a full year. Obviously, exotic ear piercings aren't everyone's cup of tea, but they can be great alternatives for people who want to explore the possibilities. Just understand that these placements may be a bit beyond the capabilities of the average piercing professional, so it's usually best to seek out full body modification studios for technicians who are experienced in performing piercings through cartilage.